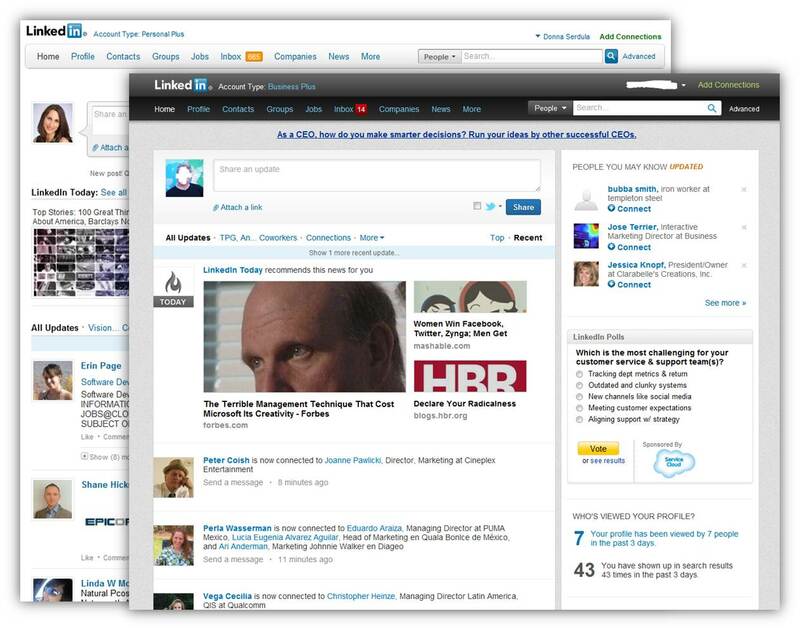 Has LinkedIn Gone Social With The New Look? If you have logged in to LinkedIn today you will have noticed that they have a new look. I’m guessing this has been done for two reasons, to make navigation easier and to make the site look a little less like a website and more like a social place. I can’t find anything yet that has significantly changed other than the look, but knowing the guys from LinkedIn there will be some changes hidden somewhere. I noticed the change because the e-mail i get each week about the jobs I might be interested in was on the money this week, and there was a couple I took a look at. I’m not looking for a job but curiosity always draws you in to look at anything you could do if you really wanted to. If LinkedIn have tightened up the matching algorithm to offer jobs of real relevance, then this will make the channel more attractive from an advertising point of view. On the subject of LinkedIn advertising, I’m a big fan of the channel for PPC campaigns because the structure of profiles makes targeting the right audience so much easier and logical. Facebook is brilliant for targeting by interest. i consider this emotional advertising, where as LinkedIn is logical advertising based on the business case. A combined approach through PPC has to offer the best of both worlds, and thinking this way (along with the type of job), makes channel selection much easier. Test both and see how you get on. Whilst LinkedIn is primarily used by recruiters as a sourcing channel and point of reference, the target audience is there for PPC. I think it is worth thinking beyond advertising jobs, and taking a more Facebook like approach to content. On Facebook, advertising community pages is far more successful for me than advertising jobs. The applications come once you get people to a page about the business rather than just the jobs. When people get there, some will apply, and through advertising you can influence who comes to your page. The same strategy could work on LinkedIn if you take a more social approach, with ads to invite to groups, content, events or company pages. The challenge for LinkedIn is two-fold. it’s not a very social channel, and access is increasingly coming from outside of the channel via e-mail, applications and extensions. They are seen as “the office”, and people just don’t behave in a social way. Whilst the new make over might look to be purely cosmetic, I think it gives it a social feel to channel. Theres more prominence for LinkedIn Today, and content recommended for you to look at based on the filters you have set and your profile. The highlighted posts are based on the number of shares and likes, and because it’s based on your profile and topic selections, the content is very relevant. I already go to LinkedIn Today when I’m short of blog content and want some inspiration from what is trending. This also encourages users to post content to LinkedIn updates first, and share the link. Each retweet you get of a LinkedIn link counts as a LinkedIn share, and what gets shown on a users home page in the prominent LinkedIn Today section above the updates is set by the most shared, liked and commented according to your filters. If more people start visiting the home page on a casual basis then being featured here will prove very valuable for gaining targeted audience. The update feed is on display under LinkedIn Today, and looks more like a Twitter feed than the old look, with easy update, like, share, comment and share to Twitter. Your update stream is refreshed by clicking on the tab that shows the number of updates from your connections since you logged on. Given that your network on LinkedIn is going to be a lot more focussed around your professional life than any other channel, the updates and shares are likely to be more relevant and business orientated, cutting out the noise that surrounds updates in Twitter or Facebook. The challenge for LinkedIn is getting users to view the channel in a more social way, and not just as a reference channel for sourcing, checking people out or referencing them. Perhaps this new look will help with this. Other features on the new look landing page are People you may know, placed at the top and bottom of the right hand column to encourage connecting, (the algorithm seems to be getting better in this area to), who has viewed your profile and how many times you have come up in searches, jobs you may be interested in, groups you may like, events and updates from all of the applications you have added to your profile. This last part is quite interesting because it means my home page is personalised according to the user choices I have already made. In my case I get to see updates from slideshare, my wordpress plug-in, Amazon reading list, box-net, company buzz (which notifies me of mentions of my company on LinkedIn),and blog connect for the latest posts I have chosen to connect to. I can take any of these off the home page or move them around to where I want them using drag or drop. This means that users can create a personal space on their home page, with access to the apps they have chosen to use. You can also interact with the apps, doing things like uploading presentations to slideshare or add events without the need to go to your own profile or app dropdown. The drpdowns on the top bar are also much cleaner looking and user-friendly, with a different colour background and a border. It is convenient and quick, all LinkedIn need to do is promote this hard to get more people familiar with the home screen and using it on a casual basis, interacting more with the update screen. I’m going to be monitoring this more over the next few months to see if the interaction, comments, likes etc go up as a result. An extra feature I would like to see in updates is showing video in the stream. You can add images to updates and get them to appear provided you add them manually (which is why you should manually update over automated postings). images lead to many more click-throughs in my experience. > Product – Like LinkedIn recruiter and others. > API Access – Paid by third-party applications and products. I’m sure they will test all of these options to the full and natural selection will dictate the decision over where they decide to focus the users. The other barrier LinkedIn need to change to make the channel more social is to change the users perception of the business itself and brand LinkedIn. When I think about Facebook, Twitter or Google as businesses I see them as quite funky. They do things like hack days, wear hoodys, make fun videos etc. think about the daily changes to the Google home page or some of the pranks they have pulled in searches, like searching for Chuck Norris in the lucky search and getting the reply “You don’t find Chuck Norris, Chuck Norris finds you!”, think about the image of Facebook employees and you think eccentric geniuses who get to code the platform from day 2. Think Twitter and you think much the same, with the addition of that very funny video they made earlier this year that got over a million views. Now think LinkedIn and what do you see? A more staid, professional, suited crowd. Business like professionals with no room for fun. Not a social crowd, so how could they build a social product? I’ve met quite a few of the London employees in their own environment. There wasn’t a suit in sight, plenty of communal areas, hot desks etc that fly in the face of this. It might be a good strategy for them to show more of this to change popular perception of them as a business, that professional can be social. LinkedIn’s own mid-year review took place last week, and they used the opportunity to produce this video which shows a different face to the business:.They’ve also set it as the featured video when you go to their official YouTube channel, so perhaps they are thinking the same way. I like the new look and feel of the home page. More interaction with the home page by users should create more interaction with user updates and content, and that means more targeted shares, it also makes PPC a lot more attractive a proposition. At the bottom of the post I’ve also added a recent webinar by LinkedIn on getting more from your ads, it’s worth a look. There is a lot more to it than you might think, and audience targeting can be very specific to reach the right eyes. The challenge is getting the right eyes to the channel regularly, and the new look might just do that. What do you think of the new look LinkedIn?